With the constant changing of laws and regulations we have added a new alarm to our line. The Hardwired CO Alarm is a great addition to meet those needs. 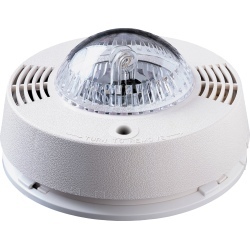 It is also a great addition if you have existing hardwired interconnected smoke alarms and you want to be alerted when carbon monoxide is present in your home. The Hardwired CO Alarm can be interconnected with those existing smoke alarms and is especially beneficial when there are living spaces on different levels of your home. This alarm also has a battery back up to ease your mind in case you lose power in your home. I get many questions about our Strobe Light Smoke Alarm. This alarm is specifically made for the hearing impaired, however anyone can use it. There have been some changes made over the past years. This alarm now requires you to purchase a hardwired smoke alarm or a Hardwired CO Alarm. The Hearing Impaired Strobe Alarm just plugs into the Hardwired Smoke Alarm or Hardwired CO Alarm and it will function properly. In the past the Smoke Alarm/CO Alarm was built with the strobe function attached. The strobe flashing light has 2 different flashing patterns to distinguish the difference between smoke and CO. This alarm meets UL standards and requirements of the Americans with disabilities act. When replacing smoke alarms in the hallways of your home one aspect lots of customers don’t think about is the “darkness” factor. If you have a dark hallway or even a dark area of your home it may be a great idea to replace your smoke alarm with one of our Escape Light Smoke Alarms. If you were ever have a fire this alarm will sound and cast a light making it easier to see when you are trying to get out. This would especially be great to use around children’s bedrooms or guest bedrooms where they may not know their way around your home as well. Important documents don’t just reside within an office. Many people (I’m sure) can account for having documents of grave importance stored within their home whether in a dresser drawer, shoe box, or small file cabinet purchased from an office and/or general merchandise store. Documents such as birth certificates, social security cards, wills, deeds, purchase receipts, tax papers, etc., calls for occupancy where these documents can be stored without getting damaged and/or tampered with. The First Alert Hanging Folder File Box will solve a lot of problems by providing a storage compartment to store your files, security (which are provided with two entry keys), and organization. Through the transition of moving documents from one place to another (due to that place of holding being damaged, etc) a lot of times, things may get pushed around and/or misplaced from its usual place; causing an uproar when you may need to retrieve these documents and can’t find them because you thought they were placed in a certain spot only to be found now misplaced. Having this file box will not only help to keep your documents organized, but will help keep them in a secure place. Not to mention this file box is portable too! Everywhere you go, it can go. No one wants to deal with the after-effects once severe weather such as a flash flood, heavy rain, or thunderstorm has swept the area; especially if such severe weather created a flood within your home, garage, or anywhere within your area where water can be collected. The time it takes to clean and rid the water can be lengthy; more so the unforeseen cost to repair anything in site damaged by the flood. Perhaps if you had not had the chance to buy home owner and/or renter’s insurance, you are asking to pay a pretty penny to replace those things (especially those things necessary) damaged by the water intake let alone to repair the damaged area. Coming soon within a matter of days, you have the opportunity to purchase some help. First Alert’s Water Alarm is a 3 pack alarm with sensors that alarms when the unit senses water. Having this alarm, you are able to detect water gathering at a very early stage and be able to (if possible) remove and/or rid those things surrounding the water intake (if not able to remove the water) before the flood damage those goods you may not have the unexpected means right away to replace/repair. Although we can not stop nature, we can at least be prepared for when it strikes and take action just in time. To view the First Alert Water Alarm (3pk) product and its specks, please click here. As a consumer, we all know anything that is “efficient” saves. Efficiency saves time, convenience, and the most important money to be able to accommodate all (if not most) at a small / better yet an affordable price whatever the substance is you are trying to optimize. In this case anything that is “energy-efficient” saves on our use of natural resource energy and preserves our eco-system. On FirstAlertStore.com, First Alert allows consumers to achieve this task with the new Motion Sensing Light Socket + CF (Coming Soon). This Motion Sensing Light Socket, like the original one, works in garages, closets, laundry rooms, and basements as well. However with this brand new motion sensing detector, you are able to use your energy-efficient bulbs (compact florescent bulbs up to 50 watts / 100 watts for incandescent bulbs). What a better way to see even into the future with brighter light! For a list of our other convenient First Alert Home Safety Products, click here. For more information, product and specs, please click here.